Confused by San Francisco’s Public School Lottery? Here’s Our Explainer. 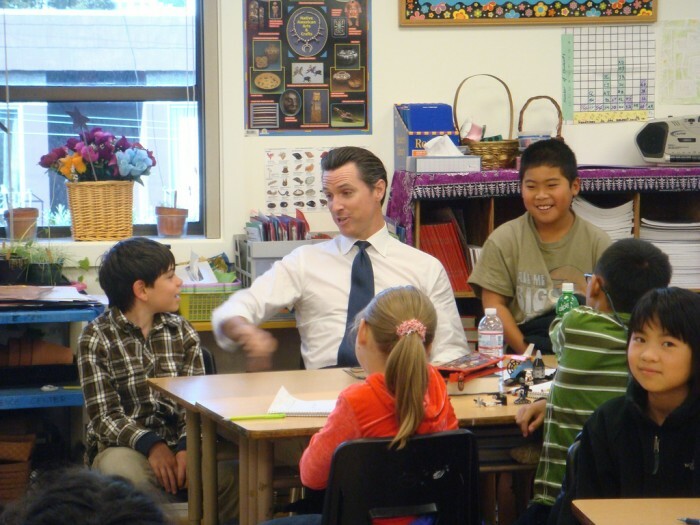 Former San Francisco mayor Gavin Newsom visits with students at Alamo Elementary School in the Richmond District. Choosing which San Francisco neighborhood to live in with young children may seem daunting – particularly for parents who plan to use the city’s public schools. The San Francisco Unified School District’s enrollment lottery can be notoriously complex and stressful, in part because the district doesn’t guarantee students a spot at their neighborhood school. However, recent changes to the assignment algorithm and lottery have helped simplify the process, district officials say. The district’s algorithm attempts to give all applicants their highest choice possible, while using a number of “tie-breakers” to determine who gets the most coveted spots. When the number of applicants exceeds available kindergarten spots at a given school, the district gives first priority to siblings of enrolled students. The next tie-breaker goes to students who live in the school’s attendance area and are enrolled in one of the district’s preschool or transitional kindergarten programs in the same neighborhood. Preference then goes to children living in low-performing areas of the city, primarily in the Mission, Bayview, and Western Addition. SFUSD awards the final tiebreaker to students who live in the desired school’s attendance area. At highly coveted schools, such as Clarendon Alternative Elementary School, it’s common for few spots to go to neighborhood residents with no siblings already enrolled. In 2011, there were more than 1,800 applicants for 88 seats at Clarendon. The first 40 spots went to siblings of current students, followed by 30 seats for children living in low-performing neighborhoods. That left just 18 slots for other applicants. One resident who lives across the street from Clarendon and didn’t get into the coveted school or any of his choices last year told the San Francisco Chronicle that he was considering leaving the city or enrolling his child in private school. Nonetheless, most students (56 percent of kindergarten applicants, 70 percent of prospective sixth-graders, and 73 percent of incoming ninth-graders) did get their first choices for the 2012-2013 school year. Of course, not all students want to attend their local school; the district reported that in 2011 fewer than half of kindergarteners included their attendance-area school on their requested school list. “City-wide” schools like Rooftop School and Claire Lilienthal Alternative School use the same admissions criteria as neighborhood schools, although students who live nearby aren’t given any preference since those schools have no attendance area. The first round of school assignments go out in March, but families still have several other rounds, as well as wait lists, if they’re willing to hold out for a different school. For more information on the district’s enrollment process or to read placement reports, go to www.sfusd.edu/enroll.